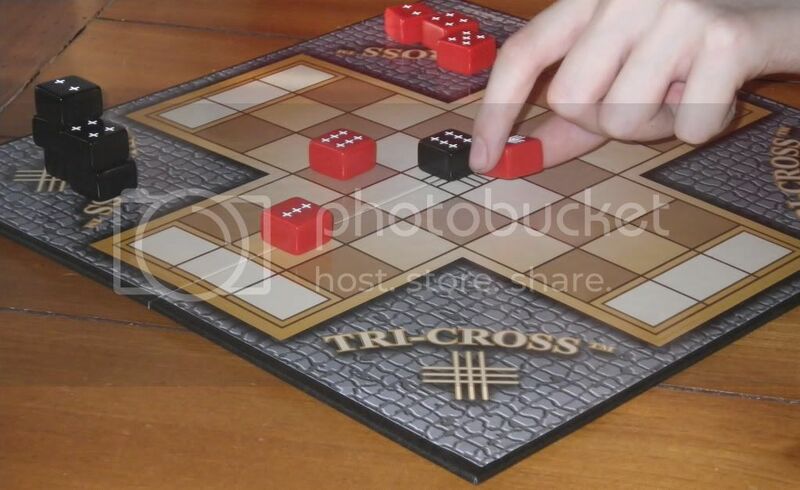 Games for Competitors sent us two versions of the game Tri-Cross. 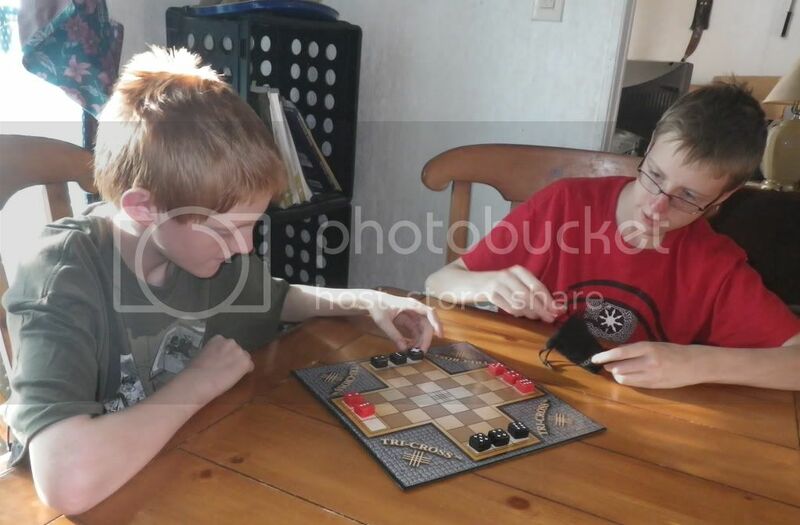 In most of these pictures, the kids are playing with the standard board game. 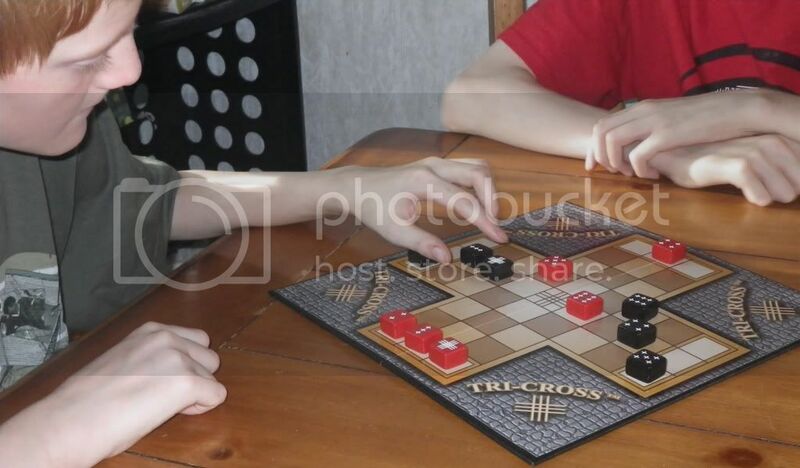 Tri-Cross can be played by 2 to 4 players, and is recommended for kids as young as 8. I have to say that Connor and William (14 and 12) did great with it. Thomas (age 10) didn't pick it up quite as quickly, but did eventually do great with it. Richard (age 7) really wasn't that interested in doing more than watching. Trina (5) didn't even do that. 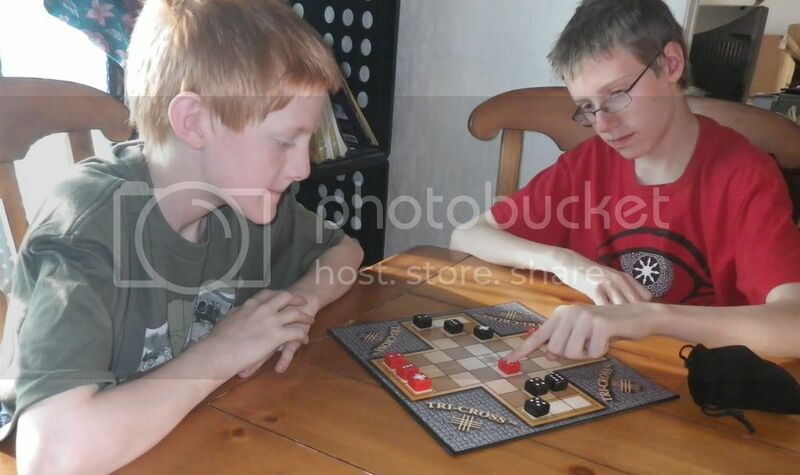 Here they are playing the beginner version, where the pieces are laid out face up, in a predetermined pattern. It didn't take long at all for the kids to memorize the set-up. 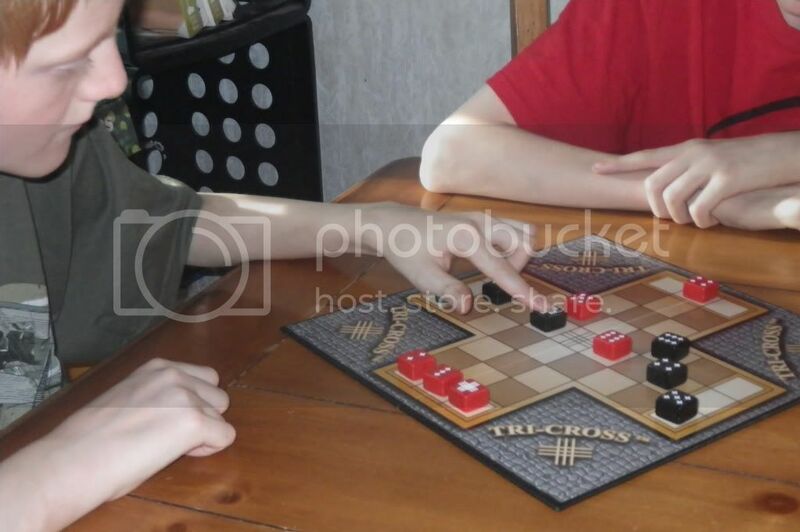 The kids described the game as a cross between chess and some other strategy games. The best part? The game goes fairly quickly. Though as the kids got better, the games did get longer. However, this is still something they can play in a relatively short time. I'm not going to try to explain the rules... but it is fairly simple to understand... grasping the rules took only a couple of minutes. There is a video or two on the website. We also received a disk that was supposed to have video on it. Ours didn't work, but the videos on the website got us going quickly, so I never investigated getting a replacement. 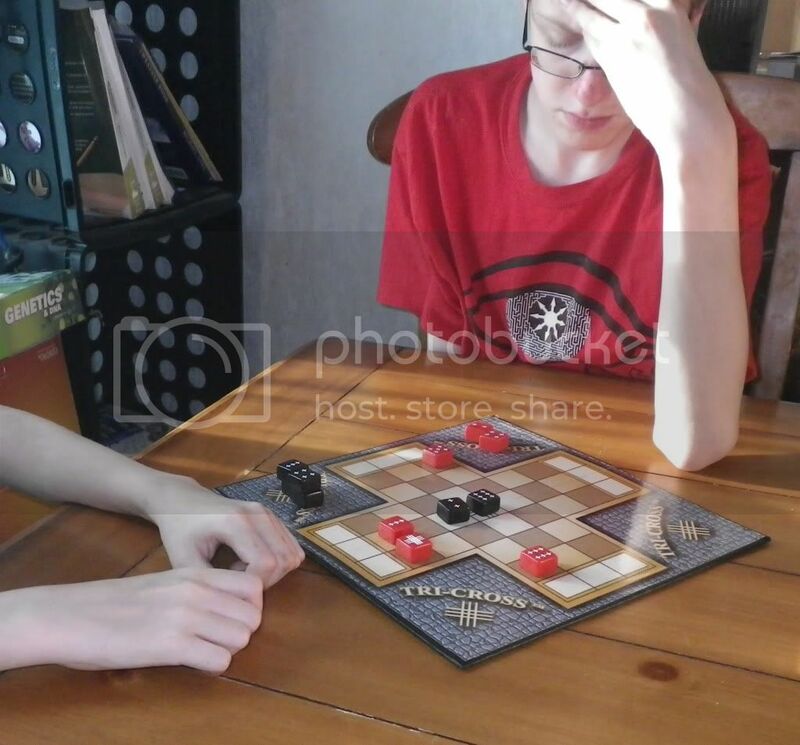 As you can see from the expression on Connor's face, it requires some strategic thinking. Mom's favorite part? Logic, memory, planning... all the great things about games of strategy. The travel game is shown above. 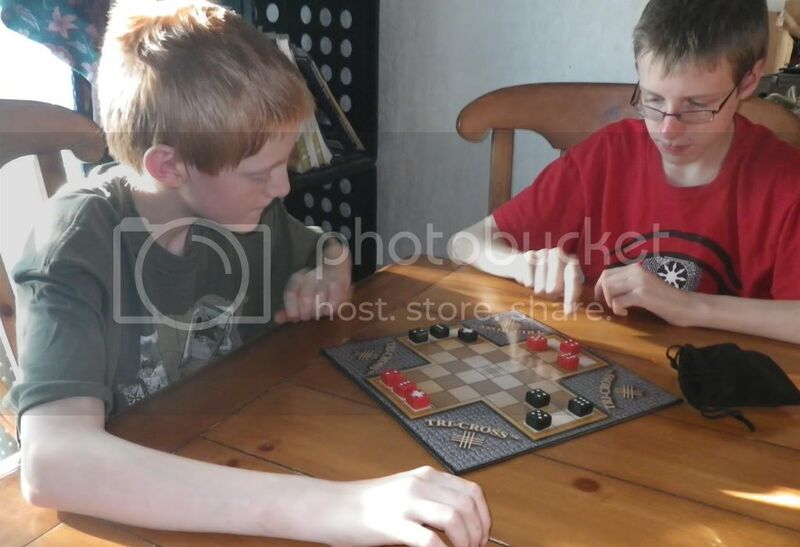 And the kids are playing the advance version (where the pieces are placed face-down). This quickly found a home in the van. I should have gotten a picture there... it is great to have that as an option for killing time when we are stuck somewhere unexpectedly. 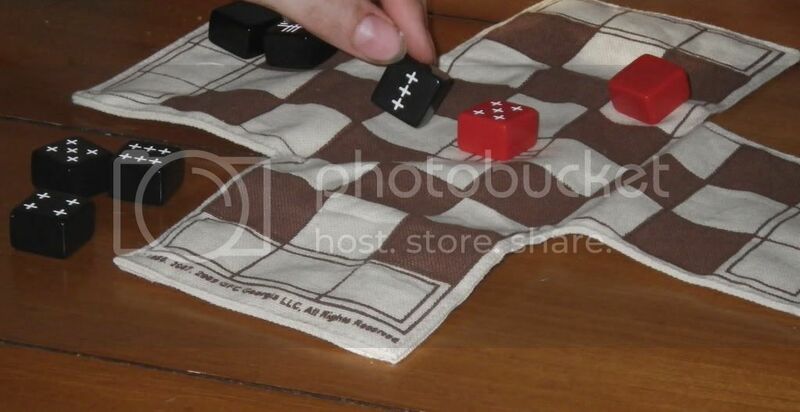 This game is a huge hit in our household. The standard version is available for $24.95. The Eco-Edition/Travel version is only $19.95. Disclaimer: As part of the TOS Homeschool Review Crew, I did receive these games in exchange for my review of the product. All opinions are my own, and receiving complimentary products does not factor in to my opinions. For more about my take on reviews, visit my blog post here. We're loving this game! One of the best products we've received so far this year! I love how simple the rules are, yet the game is still so challenging.